Posted on 21, November 2016 by EuropaWire PR Editors | This entry was posted in France, Internet & Online, Sports, Sweden, Technology, Telecom and tagged digital experience, Ericsson, Frédéric Longuépée, Helena Norrman, Parisian football club Paris Saint-Germain. Bookmark the permalink. STOCKHOLM, 21-Nov-2016 — /EuropaWire/ — In a press conference held at the iconic Parc des Princes stadium today, Paris Saint-Germain and Ericsson (NASDAQ: ERIC) announced their official partnership, focused on building the new digital experience of the Parisian club. With Ericsson’s expertise, the club will become one of the leaders of sports technology. Under the terms of the four-year agreement, Ericsson will become an Official Partner and provide Paris Saint-Germain with a range of solutions and services that will transform the digital experience for fans, players and support staff alike. Ericsson will provide Paris Saint-Germain with three main types of support: a sports performance information system; a digital experience backend system; and technology consulting and innovation services. This partnership will allow Ericsson to showcase its digital know-how and engage with football fans globally thanks to the club’s growing international footprint. Ericsson will create, operate and manage a sports performance information system as a service for Paris Saint-Germain. The information system will consist of a centrally managed data storage platform that stores, manages and controls data captured from all of Paris Saint-Germain’s sports-related businesses. Secondly, Ericsson will create, operate and manage a digital experience backend system which will be the single point of access to data and services required by all of Paris Saint-Germain’s digital platforms, including its web site, mobile apps, onsite fan experience solution, and in-stadium big screens and monitors. 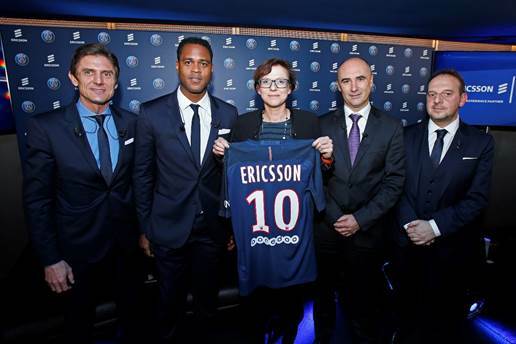 Thirdly, Ericsson will provide Paris Saint-Germain with technology consulting and innovation services. A joint team of Ericsson and Paris Saint-Germain staff will analyze and define new solutions, innovations and improvements.